Giraffe sees the birds in the sky and wishes she could also fly. But all things are possible in dreams, and Giraffe soon finds herself soaring through the clouds. The animals and birds are her friends, and they cheer her on as they join in her fun. Birds Can Fly and So Can I is written in rhyming verse, illustrated in bright and cheery watercolor. Everyone has wishes and goals, and Giraffe’s adventure reminds kids that dreams can come true. 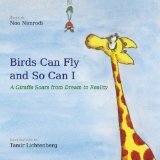 Positive and uplifting, this charming book will inspire them to reach for those dreams.